Community ANALYSIS: As Quebec Faces Historic Election, Is the CAQ Good for the Jews? ANALYSIS: As Quebec Faces Historic Election, Is the CAQ Good for the Jews? Early this month, Quebecers signaled their desire for change by delivering a majority mandate to the CAQ (Coalition Avenir Quebec), a political party in Quebec which was founded only seven years ago. The leader of the party, Francois Legault, is a wealthy businessman, co-founder of Air Transat, a Canadian low-cost airline. The recent election was quite a gamechanger. Since 1970, the only two parties to hold power in the province of Quebec were the incumbent Liberal Party, also known as the PLQ (Parti Liberal Quebec), and the PQ, the official separatist party. Two parties that until recently were on the margins are now in the mainstream: the CAQ, a center-right party, and Quebec Solidaire, which is decidedly left wing – though the latter has too few seats to maintain official party status in Quebec. That the PQ suffered such devastating losses, having gone from 28 seats to nine, is no big surprise. The official mandate of the party was always Quebec independence, a cause that has thankfully been almost completely abandoned by Quebec voters. In fact, for the first time in many years, talk of a referendum on independence wasn’t even an election issue. Even the party’s leader, Jean Francois Lisee, lost his own seat in Rosemont, and has since resigned as leader of the PQ. At present, the PQ doesn’t have enough seats to maintain official party status in Quebec. More surprising, though not completely, was the PLQ’s fall from grace. The party that had been in power for 15 years (except for a brief PQ stint in 2012) and had 68 seats only retained 32 after the CAQ’s stunning election victory. It seems that voters were tired of the Liberals’ complacency and wanted a change. They were also tired of Liberal party leader Philippe Couillard’s disdain for public opinion and his refusal to apologize for anything — neither the fact that his government’s austerity budget has hurt the province’s education and healthcare nor his decision to stand by his health minister Gaetan Barrette, likely the most hated member of his cabinet. David Birnbaum, a member of the badly defeated PLQ, won 74 percent of the vote for his seat as the MNA of D’Arcy-McGee. The riding (electoral district) includes heavily Jewish neighborhoods such as Côte Saint-Luc and Hampstead; it also includes a part of Montreal’s Côte-des-Neiges–Notre-Dame-de-Grace borough. The riding had one of the lowest voter turnouts in Quebec: Only 47 percent of voters managed to vote, compared to 72 percent in 2014. 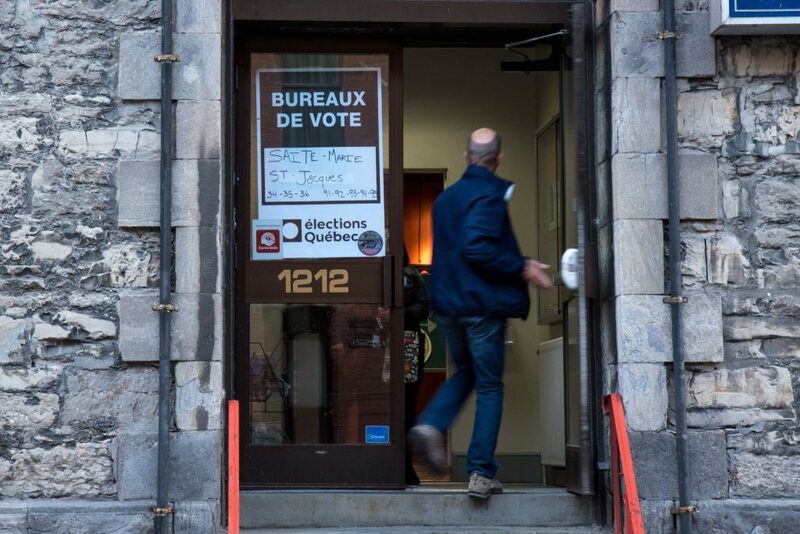 One of the reasons for the dismal voter turnout in Côte Saint-Luc and Hampstead may have been the fact that observant Jews in Quebec were unable to vote in the general election this year, since it fell on October 1, which was Shemini Atzeres. The government promised to accommodate people on other “advance polling” days. However, the early voting stations in Côte Saint-Luc and Hampstead were plagued by issues: There were hours-long delays, no air conditioning in 90-degree weather, and continuous computer glitches. As a result, many voters who actually showed up at the advance polling stations did not cast a ballot. Outremont and other areas with a large concentration of observant Jews may have been similarly affected. Once the Liberals were ousted, Quebec voters turned their attention to the party in power. They didn’t have to wait very long. The morning after the election, premier-elect Francois Legault announced that he would not go back on his controversial campaign promise to reduce annual immigration to Quebec and institute language and values tests for those looking to immigrate. He also said he would be introducing a “secularism law” that would prohibit public servants in positions of authority – including school teachers, police officers, and judges – from wearing religious symbols such as the yarmulke or hijab. (For now, it appears doctors are exempt.) A spokesperson for the transition government, CAQ MNA Geneviève Guilbault, said that should any employee refuse to abide by the law, they would have to “move to another job that is not in an authority position” or leave the civil service. Harvey Levine, Quebec Regional Director of B’nai Brith Canada, said that to suggest that public or authoritative figures must hide aspects of their religious beliefs is “at odds” with Canadian values. Following negative reaction from all sides, the CAQ softened its stance somewhat, saying that a grandfather clause could be applied which would allow teachers already in the system to continue as before. New hires would be expected to adhere to the new policy, which the CAQ threatens will become law. The weekend following the Quebec election, 3,000 people turned out for a protest in Montreal against the premier-elect’s first edict to ban all hijab-, turban- and yarmulke-wearing men and women from visible government and teaching jobs. Hundreds of protesting women wore hijabs, and even a few niqabs. There were men in robes and colored caps, and even a few Orthodox Jews. Whether the outcry against the new racist policies have had any effect remains to be seen.